The two launches are scheduled five-and-a-half hours apart, beginning with the blastoff of a Soyuz-2.1a rocket from the Baikonur Cosmodrome in Kazakhstan at 1101:35 GMT (7:01:35 a.m. EDT) carrying the Progress MS-11 cargo freighter with several tons of fuel, food and supplies for the space station and its six-person crew. A Soyuz ST-B rocket at the Guiana Space Center on the northeast coast of South America will be filled with its kerosene and liquid oxygen propellant supply soon after the Soyuz launch in Kazakhstan, with clocks there ticking down to a liftoff at 1630:37 GMT (12:30:37 p.m. EDT) with four O3b broadband satellites. 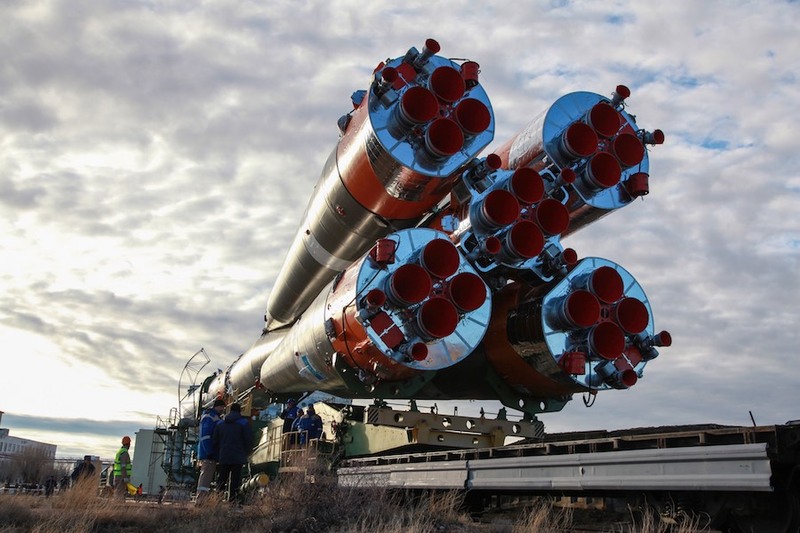 It won’t be the first time two Soyuz rockets will launch on the same day. A pair of Soyuz boosters blasted off less than two hours apart on June 25, 2013, from Kazakhstan and French Guiana. Separate teams prepared the Soyuz rockets inside similar hangars at the spaceports in Central Asia and South America. Both rockets rolled to their launch pads Monday, beginning with the emergence of the Soyuz rocket at Baikonur from its integration building. Riding behind a train engine, the rocket arrived at Launch Pad No. 31 at Baikonur, where hydraulic lifts raised it vertical. Ground teams moved folding gantry arms into place around the rocket and the Progress MS-11 cargo craft for final pre-launch processing. Hours later, Russian technicians in French Guiana transferred a three-stage Soyuz ST-B rocket to its launch pad. Unlike the Soyuz launch pads at Baikonur, the launch facility in French Guiana has a mobile shelter that moved around the rocket after rollout. Another major difference between Soyuz launch campaigns at the different launch sites is that satellite payloads at the Guiana Space Center are installed atop the rocket vertically — after it is erected on the launch pad — while spacecraft are attached to Soyuz boosters horizontally at the Baikonur Cosmodrome. The Soyuz-2.1a rocket set for launch Thursday from Baikonur will be fourth flight of a Soyuz booster this year. 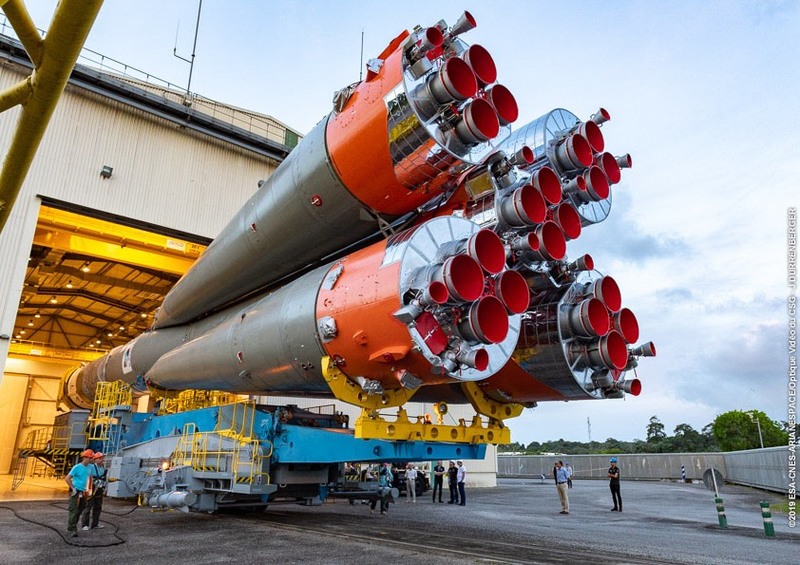 The Soyuz ST-B launch from the Guiana Space Center five-and-a-half later will mark the fifth Soyuz flight of 2019. The two types of Soyuz rockets use the same basic design, which dates to the 1950s. The Soyuz-2.1a configuration includes an upgraded digital guidance computer. The Soyuz ST-B uses the same digital control system, but the rocket’s third stage is powered by an RD-0124 engine based on a newer design. Soyuz rockets shipped from their factory in Samara, Russia, to French Guiana also include changes to adapt the rocket to the tropical climate at the Guiana Space Center, and the four first-stage boosters and core stage are equipped with pyrotechnic charges to ensure the components sink after falling into the sea. Jettisoned rocket stages fall on land after launches from Russian-operated spaceports. Soyuz rockets have launched 1,901 times since the dawn of the Space Age, more than any other type of launch vehicle. 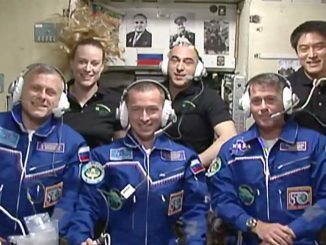 The Russian Progress MS-11 supply ship scheduled for launch Thursday from Baikonur will reach the International Space Station at 1425 GMT (10:25 a.m. EDT), less than three-and-a-half hours after liftoff. 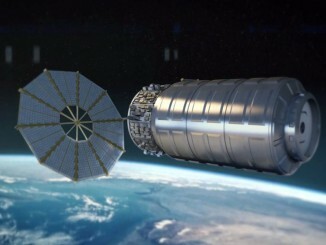 The automated freighter will dock with the space station’s Pirs module after an expedited, fast-track rendezvous profile. The Soyuz launch with the four O3b broadband satellites will be the 22nd Soyuz flight from French Guiana since 2011, where missions are managed by Arianespace, the French launch service provider. The Soyuz ST-B will depart the Guiana Space Center toward the east over the Atlantic Ocean, and deploy a Fregat upper stage nine minutes after liftoff. 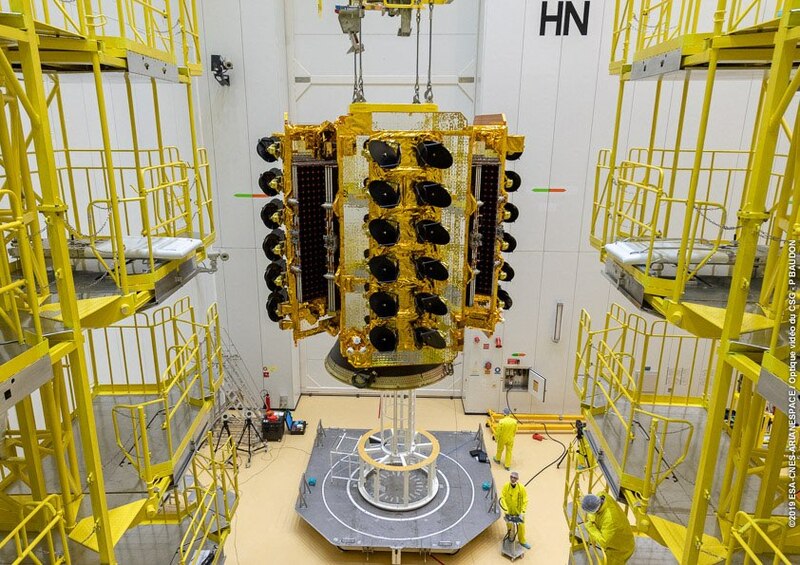 The Fregat’s main engine will fire three times to place the four O3b satellites, built by Thales Alenia Space in France, into a circular orbit about 4,865 miles (7,830 kilometers) over the equator. The O3b spacecraft each weigh around 1,543 pounds (700 kilograms) fully fueled at launch, and they will release from the Fregat upper stage in pairs beginning around two hours after liftoff. 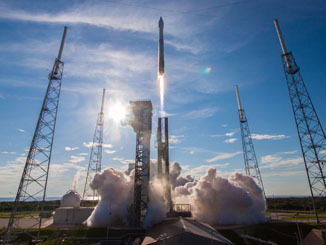 The O3b satellites set for launch Thursday will join 16 similar spacecraft launched since 2013 to beam broadband Internet signals to areas outside the reach of terrestrial networks, such as island nations, cruise ships, oil and gas fields, and other remote outposts. The addition of four new satellites will expand the O3b network’s capacity, according to SES, the fleet’s owner and operator.